Okay, I swear that I am going to start this new year right and get myself in the gym this week. Many of my friends would be shaking their heads in disbelief mildly surprised to learn that I have a gym membership. I actually never talk about it because the last time that I went to the gym was in June. Yes, you read that correctly: June. My gym is open 24/7 during the week, and when I was going, I liked to slink in about 11pm or midnight when it was completely empty. That way, I could do as little as possible without feeling self-conscious about it. I made these drop biscuits with the other wedge of CSA cheese (we get two different kinds at every pick-up), and the remaining Irish bacon from my CSA. The texture of home-made biscuits is always better than anything you could buy. Plus, they are so easy to pull together and so quick to bake, that you will want to make them all the time. And I promise to get in better shape . . . as soon as I polish off these biscuits. * This post was actually written the day after the Horseradish Cheddar and Irish Bacon Mac & Cheese one. However, in the whole hubbub following the Daring Cooks’ challenge, I haven’t had time to post it until today. In the meanwhile, amazingly awesome SweaterMeat posted her Cheesy Breakfast Biscuit Sandwiches on her blog, Ugly Food Tastes Better. If you haven’t already dropped by, check out blog and her biscuits! The point being that there must be something in the air right now about drop biscuits! 2. Combine the flour, the baking powder, the baking soda, and the salt together in a large bowl. Add the cubes of butter. Using your fingertips, blend the butter into the dry ingredients until the mixture resembles a coarse meal. 3. Stir in the grated cheese, the chives, and the bacon. Add the milk or the buttermilk all at once. Continue to stir until all the ingredients are just combined. 4. Drop the dough in twelve equal mounds about an inch or two apart on a large baking sheet lined with parchment paper. Bake the biscuits until they are golden, about 18 to 20 minutes. Yum, these look good and easy. We call these scones here in New Zealand and our biscuits are what you call cookies. 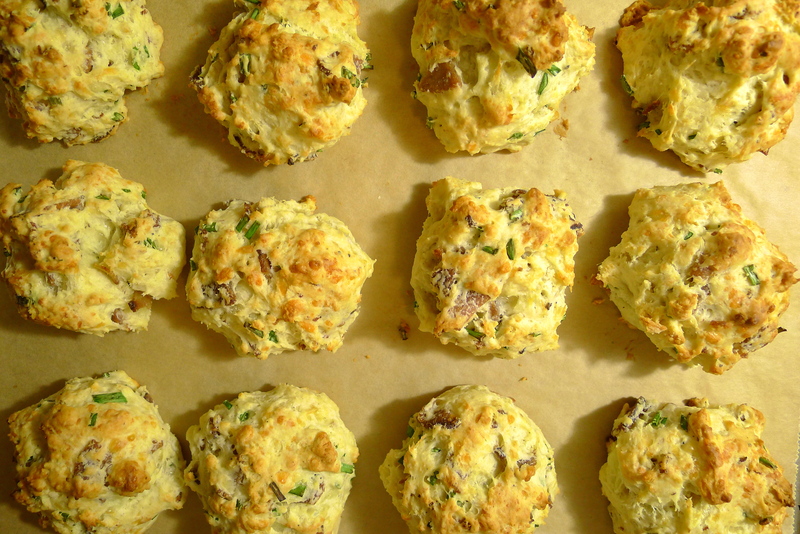 I used to make cheese scones quite a bit but bacon would be a wonderful addition. A yummy breakfast on the go. Isn’t that funny? I think we call them scones too. Savory scones, I think. My first though, actually, when I hear the word “scones,” is something triangular that also sweeter with dried cranberries and some kind of sugary drizzle . . . Thank you! They were so easy to make, and easy to store too! A “gym membership”? What’s that? I have never heard of such a ghastly invention. Bacon AND cheese……all wrapped up into one little delectable morsel! Now THAT’S what I call food. You could eat them for breakfast (with eggs), lunch (with some cheddar ale soup), or dinner (with a steak and salad). YUM. Haha! Yeah, “gym memberships” . . .! And cheddar and ale soup! Now that sounds something I want to eat right now! I know! I had something with kale and quinoa the other day freezing, rainy day. And what I really wanted was more warm carbs! These biscuits will sell well with my picky daughter who hates sweet biscuits but loves those which are with cheese and not sweet. Great recipe which I’ll try this weekend. Thanks a lot. I gotta’ admit, I’m a savory girl too! Let me know how it goes if you do it!